My husband has a not-so-secret secret love affair with this waffle recipe. Actually, his love for waffles was kept secret for awhile. I’m thinking he didn’t want me to see how he must have both butter and syrup in every square hole of the waffle. That I might think he was a bit OCD about his meticulous smearing and pouring. Well, I do think that, but we’ve been married nearly 11 years so far and if his only weird tendency is to love butter and syrup and this waffle recipe, I say things are going pretty well. Especially considering that this waffle recipe is made with oatmeal. 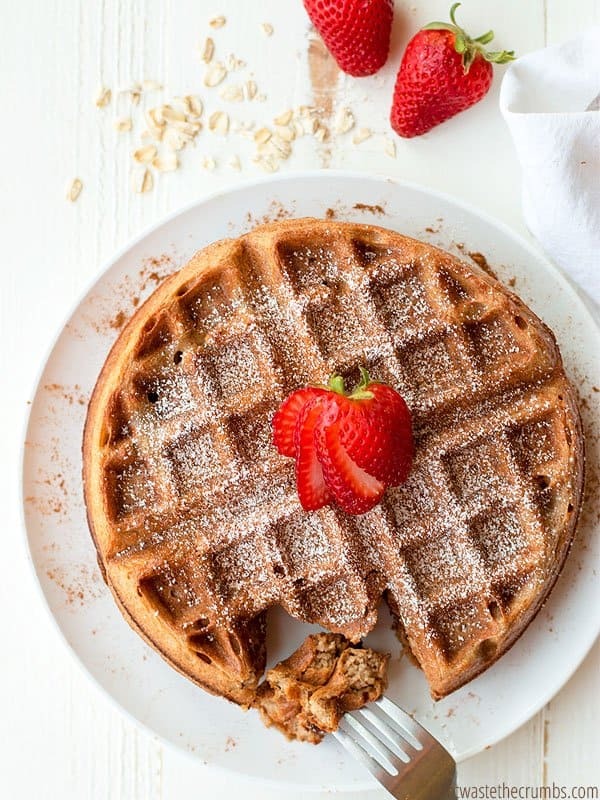 SHUT THE FRONT DOOR, yes these are cinnamon oatmeal waffles and they are gloriously delicious, ridiculously easy and the official breakfast for all Saturdays from now until eternity. Or at least until we run out of syrup. If a waffle isn’t ALL of these things, then it’s wrong. Just like that. There is no in between. But in order to find a waffle recipe that meets all four criteria, I had to do some serious research. Which meant I had to make a lot of waffles. Butter is what makes the waffle crispy and fluffy. If you skimp on the butter, your waffle will taste “okay,” but it won’t be great. It also won’t be nearly as good leftover, even if you do toast it. I use only butter (no substitutes) when I make this recipe as-is. Because butter is so amazingly good and good for you. More often though, I double the recipe (an easy way to work smarter, not harder) and will use half butter half coconut oil. I don’t think that’s the proper way to make a waffle, but they come out crazy good so I’m just going to keep doing what I’ve been doing. My daughter received a Frozen-themed waffle maker for Christmas and because that’s what we had, it’s what we used. However, making waffles for the family took FOREVER and they just came out okay. After realizing my husband’s love affair with this waffle recipe, I invested in a double waffle maker identical to this one, except I got mine at Walmart for half the price. It makes AMAZING waffles with deep pockets AND it cut the time to make waffles in half. Can’t recommend it enough! Flour: We’re using oat flour in this recipe because oats are super healthy for you and crazy cheap. I use rolled oats because it’s what I have, but I won’t judge you if you have quick oats. It’s going in the blender and getting pulverized into oat flour anyway. Sweetener: Every recipe I’ve found says to add sugar, but since I’m trying to keep this a healthy recipe, I switched to maple syrup and reduced the amount used. I also added molasses because I love the depth of flavor, but both can be omitted without seriously changing the flavor of the waffle. Fat: As I said before, we’re using butter here. Feel free to go 50/50 with coconut oil if you double the recipe. I have NOT tried halving the butter and subbing with coconut oil in the waffle recipe as written below, but I don’t know why it wouldn’t be good. Eggs: Eggs are a binder here, but I think they contribute to the crispiness of the waffle too. If you substitute this out with other binder options like pumpkin, banana, flax-egg, etc., the waffle won’t be as crispy. Still good flavor though. Cinnamon: YES! 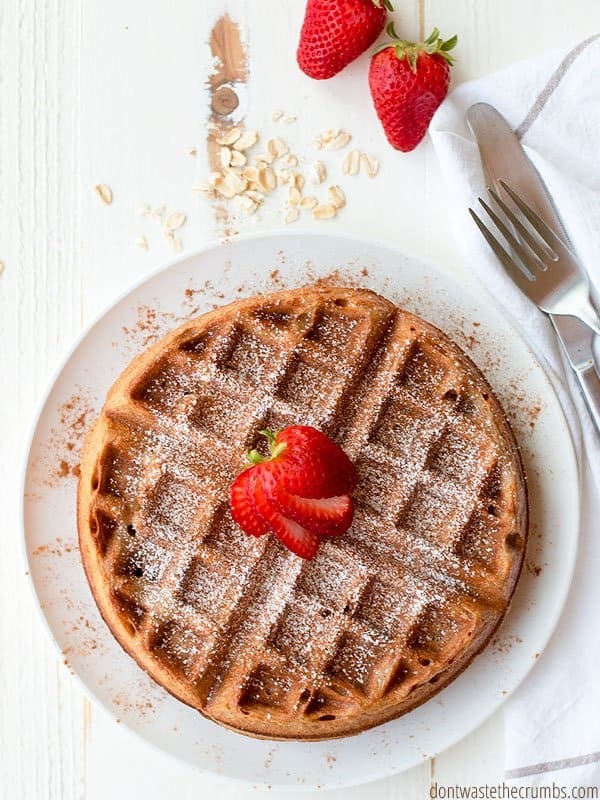 The fact that this waffle recipe contains 2 teaspoons of cinnamon is not a typo. Yes, that’s a lot of cinnamon and yes you can taste it. That’s because this is a CINNAMON oatmeal waffle recipe. If you don’t like cinnamon, omit it, but you might want to add in something else for flavor because this spice is the star of the show. If you want your waffles to stick together, go with method #2. If you want to easily pull out one waffle at a time without feeling like you’re peeling two bricks apart, then go with method #1. Another option is to place a piece of parchment or wax paper between each waffle and freeze in a stack. I haven’t tried this method myself because both parchment paper and wax paper are pricy (in my opinion), so I go with method #1. It’s the cheapest and it works. Batch cooking and Freezing are some of my tricks to getting breakfast (or dinner!) on the table fast. Check out my free course, 5 Days to Getting Dinner on the Table, FAST, for more ideas to feed your family real food FAST! A toaster is a great way to re-heat frozen waffles, assuming your toaster is large enough. You might have to break the whole waffle into halves or quarters so it fits. We don’t have a toaster, so we re-heat in the oven. I place frozen waffles directly on a rack in the middle of the oven and turn the oven to 350F. By the time our oven preheats, the waffle is ready. Note: My oven takes an eternity to preheat, so the waffle is in there for a good 10-15 minutes. Your oven probably preheats faster, so the first time you re-heat a waffle, use a timer and check on it every 5 minutes or so. Once you know how fast (or long) it takes, you can set the timer for the total time the next time you re-heat. Meanwhile, measure oats, baking powder, salt and cinnamon into the blender. Process on high until the mixture resembles flour, about one minute. Add 1 cup water, eggs and optional sweeteners and blend on high* into a batter, about one minute. Add the butter and again, blend on high *for about one minute. Allow the batter to sit for 5 minutes and preheat the waffle iron according to manufacturer directions. Stir the batter well. At this point the batter should be thin enough to *just* run off the spatula, but no thinner. If it doesn't, add ¼ cup water and re-blend. Pour the desired amount of batter** into the waffle iron. The batter will not spread on its own, so use a spatula to spread it all the way to the edges. Cook the waffle as desired, or according to manufacturer directions. Repeat with the remaining batter, stirring well before pouring onto the waffle iron. 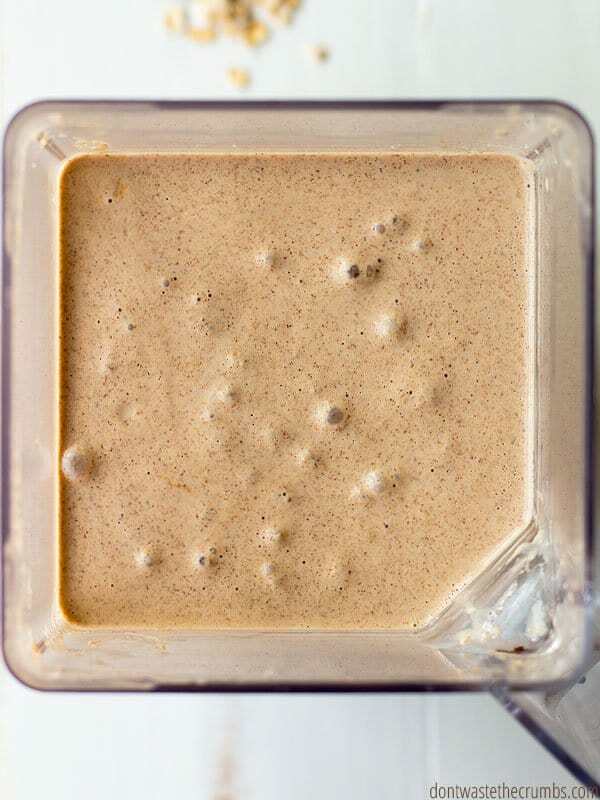 * Make sure you lid is on tight and blend on high so that the tiny specks of oat flour incorporate well with the liquids and absorb them. If the oat flour is too large, it will not absorb the liquid properly and your batter could be runny. ** My waffle iron came with a scoop that is just the right amount of batter for the waffle iron. The Frozen-themed waffle iron did not, and it used ¼ cup batter for each waffle. Every waffle maker is different, but if I had to guess, I'd say use ½ to ¾ cup batter. Remember that this batter is thick and will not spread to the edges of the iron, so be sure to use a spatula to get the batter to the edges. *** Some have stated that this batter is too thin. When you follow the recipe as written, the batter should *just* run off a spatula when dipped in and pulled out of the batter. If it is very runny, add ¼ cup oats and re-blend until it reaches this thickness. Do you have a secret love affair with waffles? Do you have a favorite flavor or topping? Or are you a butter and syrup purist too? Your blog is wonderful! It has given me motivation to eat healthy on a budget and try to DIY as much as I can. Thank you! Hi Erin! I did try making these with milk instead of water, and didn’t notice a positive change in taste or texture, so I definitely recommend water. Strange, I know! Water is better!! I had to try it both ways & the finished texture is fantastic with water. I may be adding the collagen for more protein in the future but not milk. I’m trying the chocolate waffles tomorrow! Ooh – the chocolate waffles are EVEN BETTER!!! I just made these and they are delicious! 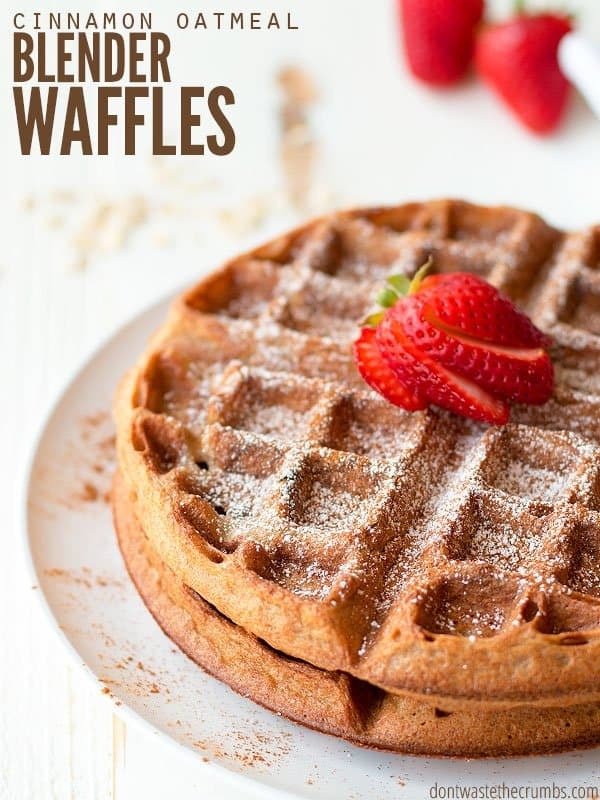 My family loves waffles, and I have been making some gluten free ones with sunbutter as the base, and while those aren’t too expensive, they are still pricier than I prefer. I love that these are gluten free, have such few ingredients, and are inexpensive, while maintaining an amazing taste and texture! Thanks so much for all your experimentation to give us this wonderful recipe! You’re so welcome AnnaKathryn! I’m glad you guys enjoyed them! I was surprised too at how simple and inexpensive the recipe is, yet SO good! Thanks for the recipe! I did use milk for added calories. It was easy and delicious. I just made these today and the batter was very runny – not thick. I did everything and measured according to your recipe but the mixture was just runny and the waffles were “holey” and did not make a thick waffle like in your picture. I used 1 3/4 c rolled oats and followed everything else except no cinnamon and no sweeteners. Thoughts? Hi Sara! Are you sure you followed the recipe exactly? If the batter was very runny, it sounds like there was too much water. Also, the batter needs to sit for 5 minutes for the oats to absorb water, and it will continue to get thicker as it sits. If you followed the recipe as-written, you can remedy by adding more oats, about 2 Tbsp at a time until the batter thickens. I had the exact same problem! And I only use 1 cup of liquid, we had hollow waffles, my family seemed to like them ok.
Katrina, did you make sure to let it sit for a little bit for the oats to absorb the liquid? Also one reader had to adjust their blend to High to make sure it blended up all the oats to thicken the recipe. That might help! I just followed this recipe and I use 1 cup of water (Not 1 1/2) nice and thick batter like it should be. These are SO delicious! I had the same problem as Sara the first batch because I used the lowest setting on my blender to process the oat mixture into flour. I think I was worried about it flying everywhere and making dust lol! So I could still see lots of pieces of oats when the batter was done. It was super runny and the waffle fell apart. So my next batch I processed it on high until the batter was really fine and there were no larger oat pieces left. It absorbed the liquids and made the thick batter. The waffles came out perfectly and didn’t fall apart. I used the max setting on our Hamilton Beach waffle maker because the kids said they wanted them crispy. We loved and ate all the waffles, even the first batch that didn’t stay together and they all tasted great! This recipe is a total keeper for us! Thank you Tiffany!!! You’re so welcome Madelyn! I appreciate you sharing your blender tips. I have a Blendtec, and use the “batter” setting and never considered how the speed might effect the batter. I’ll be sure to update the recipe. It’s always my goal to be a “keeper” in someone else’s recipe box – thank you for the honor!! I hope you enjoy these as much as we do Michelle! You can input this recipe into a nutrition calculator Charlene, but I tend to agree with you! I tried it twice and still the same results. Batter was runny and stuck to the waffle iron. I tried doing what others recommended and still was a mess. I let it sit for over an hour and batter was still runny. Yes I followed the recipe to a T! Jezika – I make this recipe every weekend and it’s always turned out without any issues. The batter sticking to your waffle iron is actually not a problem with the batter, but the iron itself. As for the batter, it should thicken up significantly within 5-10 minutes. The batter should be thin enough to *just* run off the spatula. No thinner, and it shouldn’t be gloopy. If it is, you’ll need to add more oats (1/4 cup at a time) and re-blend. So glad you liked it Blair!! Made 3 batches of this today, to serve 26 people for breakfast!! Everyone LOVED it!! Thanks again for the hit Tiffany!!! You’re so welcome Mary Katherine!! You’re SO welcome Rachel!!! Thanks for coming back to leave a review and comment! What are your thoughts on using honey in place of the syrup/molasses? You definitely can Susan! I’ve actually stopped using sweetener completely, since we usually add butter and syrup anyway. The family hasn’t noticed! No difference in amounts Lynard, as it just enhances the flavor. As I mentioned to Susan, we don’t add any sweetener anymore. Here’s a link for my blender: https://dontwastethecrumbs.com/2017/11/ways-to-use-a-blender/! These are fantastic! My kids say they are the best they’ve had. Question though – do you know of a dairy free alternative for the butter? I’m assuming they wouldn’t come out as good if they were made with oil, but I figured I’d ask just to see if you knew of anyone trying. Hi Angela! I often quadruple this recipe and split the fat to 50/50 butter/coconut oil. I haven’t made them exclusively with just coconut oil, but I bet you could! Not crispy? Maybe you can tinker with the heat level, or cook longer? Ours are always crispy. Glad they were good!! I have same waffle maker, which setting are you using on that? My 10 yo made these. They turned out perfect! Awesome! So glad to hear it Kelli! This is second time i made this recipe. Today was same result soggy thin waffles. 🙁 only difference eas i ised 2 flax eggs since we have an allergy. Heather – did you use flaxseed eggs in the first batch too? I really don’t know why these wouldn’t turn out for you. We literally make this exact recipe almost every weekend, and have never had soggy waffles. Tried these this morning. Delicious! I did use almond milk for a bit of extra protein (I’m not good at protein so I sneak it in when ever I can) and it was a bit too thick so added more to get it right. Next time I will use water! I did make a simple cinnamon sugar syrup for a drizzle along with a cream cheese drizzle. They tasted great and my yeast allergy husband was thrilled it tasted like a cinnamon roll (no longer in his diet). One suggestion, emphasize that the oats need to be certified gluten free. Some people may making it for celiac friends and not know that is quite critical. I suggest GF Harvest for oats over Bob’s (I have gotten sick on Bob’s as they now use the method of “cleaning” the gluten off the oats. Thanks for the tip Sandra, and I’m so glad you and your husband enjoyed these waffles!! I made these waffles with no changes, using 1 cup of water and the 2 TBL of maple syrup.. The batter was thin as other reviewers described, however, it did thicken up slightly after sitting 10-15 minutes. They did not crisp up as my standard wheat flour recipe does but were softer and the inside seemed slightly undercooked. I tried leaving them in a few seconds longer but then they just darkened too much on the outside without any changes to the crispness or insides. If you make a double batch, let them sit 15 minutes instead of 5. None of mine turned out very fluffy, except the very last one I poured. The batter had thickened just slightly by that point, and it was exactly what it needed to do! Thanks for sharing this tip Kristyna! This recipe is so good. You can’t stop eating them. I agree – thanks Jean! I made these as written and they came out perfectly. Thanks for the recipe! I think the quality of blender could be a problem for some of the commenters. I used to have a cheap blender and recipes would come out wrong but I finally invested in a good one and now I have no problems with blender recipes. I made these last weekend and they were delicious! I used a bit of wheat flour and almond flour because I have so many flours around. I also substituted brown sugar for the sweeter as I like a little drizzle of syrup on top of my waffles. I also love chocolate chips in my waffles so I added a few of those too 😀 I flash froze them and ate them all week for breakfast! So yummy!! I’ll definitley be making these again soon! Great additions and substitutions Carlee – I’m so glad you liked them!! I’ve made this recipe several times now and it’s always a hit! Each time I’ve doubled it and frozen the waffles for weekday breakfasts. My boys love them and I love giving them a healthy, EASY breakfast. Thank you so much for sharing your gifts and blessing my family! Aw, this made my day Kristin – I’m so glad you guys like them! I really like the look of this recipe and would like to make it, but I don’t have a waffle iron. Would this work as a pancake batter? I haven’t tested it, but it should come close Arlisa! I made these this morning for my husband and me. They were absolutely delicious even without all the cinnamon. I only used half the amount in the recipe. I got ahead of myself and added the syrup before blending the dry ingredients and was worried they wouldn’t turn out, but miracles of miracles, this recipe turns out even with a mess up. Thanks for posting such a great and easy recipe! You’re very welcome Debbie! And you’re right – this is a VERY forgiving recipe! Can I use coconut butter as a substitute for butter? Hmmm… I’m not sure Malvi! I’ve subbed coconut oil, because that’s a fat, but I haven’t done coconut butter (which I put in the same category as peanut butter). I was really excited to see this recipe as it ticked off all the boxes on our “belly friendly” low FODMAP diet. Then I was a bit nervous as the batter looks a bit like chalky wallboard paste. But they were quite good. They took about a minute longer to cook (5 minutes as opposed to 4 for my regular recipe). It’s a bit of a pain to scrape the batter out of the blender so I think next time I’ll make the oust flour in the blender then use a food processor to mix up the rest. As for our favorite waffles, I like adding pumpkin pie spice instead of straight cinnamon. We serve ours with peanut or almond butter for extra protein. These are fantastic! My 9 year old made them for a school project. She doubled the recipe and froze them so she and her sister can have homemade waffles on school days. Yay!!! So glad your daughter liked these!! These were incredible! I can’t believe so few, really simple ingredients made such incredible waffles! Thank you so much for posting this. Our whole family was thrilled to have healthy waffles this morning! These look fab, I was looking but couldn’t see how many Calories this mixture has? Hi Debra! I don’t track calories, but you’re welcome to look up the ingredients on an online calculator! Thanks for this recipe!! I usually make almond flour waffles but ran out (and it’s pricey too), so when that happens I switch over to using oat flour for everything! 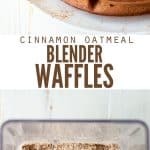 I’m dairy-free so I skip the butter altogether, and use less water (actually I use almond milk), and though the batter isn’t necessarily thick, it comes out just fine when I cook it in my waffle iron! Next time I will cut out the added sweetener (I use honey) since I put honey on them afterward anyway. They taste great with peanut butter, fruit, and other toppings! We just made these this morning, and they are a hit! I doubled the recipe, and after a little spilling trying to figure out the right way to pour the batter, made 9 pancakes in my Waring Professional Waffle Maker, using the included scoop for the amount of batter. I will admit that I made a small substitution, adding ground golden flax to make up about 1/2 cup of the oats, and the change was nice. These were filling and tasty. My 6-, 4-, and 2-year old loved them, as did my notoriously picky husband. I really appreciated that they weren’t too sweet, especially since in our house, it’s illegal not to use maple syrup on top! Thank you for the recipe! ¡These waffles are amazing! I was worried when I read some reviews that said the batter came out too runny, but I used 1 cup of buttermilk and had to add more water since it ended up being too thick. I was real careful to over process the oats, though. The flavor was incredible. I didn’t have two eggs, only one, so I used some banana as well. This is absolutely replacing my regular recipe. I’m so glad you enjoyed these Samuel!! We’ve made similar substitutions in the past, and they always turn out wonderful! I haven’t made these yet but they look and sound delicious. 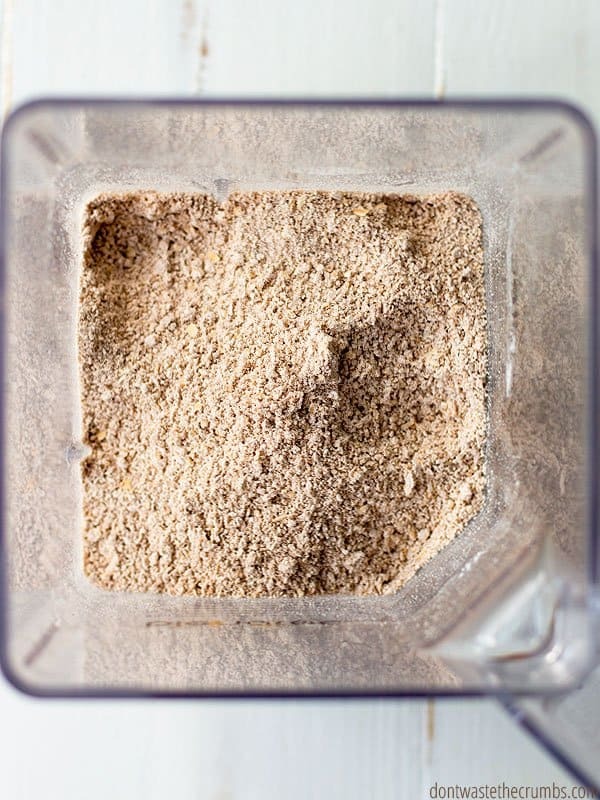 I use quite a bit of Oat Bran Flour that I already have and wonder if I could use this vs blending the whole oats? Seems like it would be the same result? It might Janet – it’s worth a shot! Wow, wow, wow! I recently was was forced to make a lot of dietary changes for a health condition, and when I saw this recipe met my guidelines, I was excited. I made them this morning and I am beyond thrilled! I like them much more than my traditional waffle recipe, and will be making them over and over again. You have made my day! Thank you!!! I have rated the recipe 5 stars, but it honestly deserves at least 10. This was amazing i added some grounded flaxseeds and buckwheat flour and a bit of bran so yummmy! great recipe thank you for this recipe. Highly recommended. Delicious! Easy to make! I halved the recipe! Thanks much! I love this recipe! I don’t have a waffle iron, but I learned that if I use half the fat I can make pancakes out of it. I make these almost every weekend with 3Tbsp coconut oil in place of the 6Tbsp butter. This morning I used this batter to make Instant Pot pancake bites. It works out great. I’ll be making them this way through the heat of summer since making them in an IP means not standing over a hot stove. Thanks for a great recipe. I definitely give this 5 stars. What a great hack Cheri! Thanks so much for sharing this with us!